Meanwhile, start making your turkey ragu sauce. Start by softening your onion for a few minutes in a little olive oil, then add the garlic, cinnamon & oregano and cook and stir for a couple more minutes. Add the turkey to the pan and brown while breaking up with a wooden spoon. Then add the tomato puree & water and wine. Let the sauce simmer gently until it has thickened (about 20 to 30 minutes). At the last minute, add in the parsley and salt and pepper to taste. Start with a layer of eggplant/aubergine slices, followed by half of the ragu sauce, another layer of eggplant/aubergine, another layer of meat and a final layer of eggplant/aubergine. Finally, pour the yoghurt topping over the top and smooth it out. Bake for forty to forty-five minutes or until the topping is golden and bubbling (cover it with aluminium foil if it gets too dark). 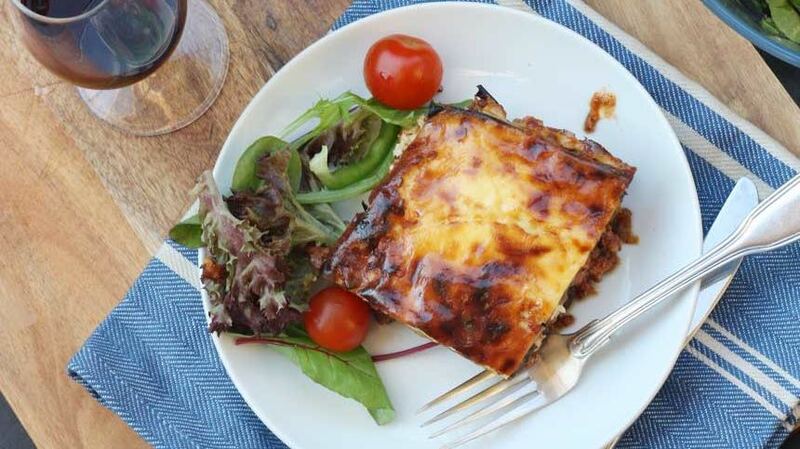 Leave the moussaka to rest for half an hour before serving (so that the pieces stay together better when you cut and serve them). For a more authentic flavour, use Greek kefalotiri cheese in the topping if you can find it. 1) Combine all of the ingredients into a medium saucepan, and mix well. 2) Bring to a boil, and reduce to a simmer for several minutes until the desired consistency is reached. *If you like your bbq sauce thicker, then cook it for a bit longer! 3) Add 3/4 cup to your shredded turkey and serve, and store the rest in the fridge.